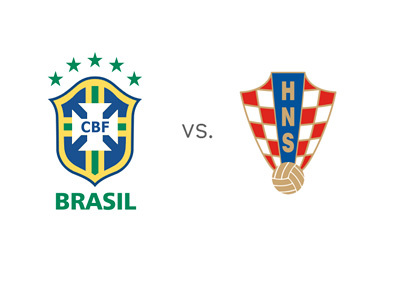 The 2014 World Cup host nation, Brazil, meet Croatia in the tournament's opening game on Thursday, June 12th, 2014 at the Arena Corinthians in Sao Paulo. Brazil are coming into this game as the heavy favorites, not only to win vs. Croatia, but to win the whole tournament in front of their own fans. There is a lot of pressure on Brazil at the moment and the players seem to be handling it well. The Barcelona forward and Brazil's number 10, Neymar, is the team's central figure and the eyes of the world will be on him when the game kicks off on Thursday. Other players to watch out for are the striker pair, Hulk and Fred, while in the back, Thiago Silva and David Luiz, both from PSG, are two of the most valued defenders in the game. Croatia qualified for the World Cup by beating Iceland in the European playoffs, after finishing second in their group behind Belgium. The Croatian midfield trio, which consists of Real Madrid's Luka Modric, Sevilla's Ivan Rakitic and Inter Milan's Mateo Kovacic, is one of the best in the tournament according to the experts. Bayern Munich's star striker, Mario Mandzukic, will have to miss the opening match due to a suspension. Brazil are big favorites to beat Croatia. The most likely score on Thursday, according to the odds, is a 2-0 victory for the hosts, valued at 9/2. Will Neymar & Co. be able to live up to the expectations? This World Cup opening game could be one of the most watched sporting events in history. Mexico and Cameroon, the other two members of Group A, will meet the following day on Friday, June 13th, 2014.